Sometimes you see a campaign and have to just admire the breathtaking, almost swaggering absence of self-reflection – of any voice asking ‘Could anyone have an issue with this?’ – as it was passed up and down the chain before being signed off. Which brings us onto Mastercard’s World Cup initiative with the World Food Programme that provoked an enormous backlash on social media within minutes of its launch. 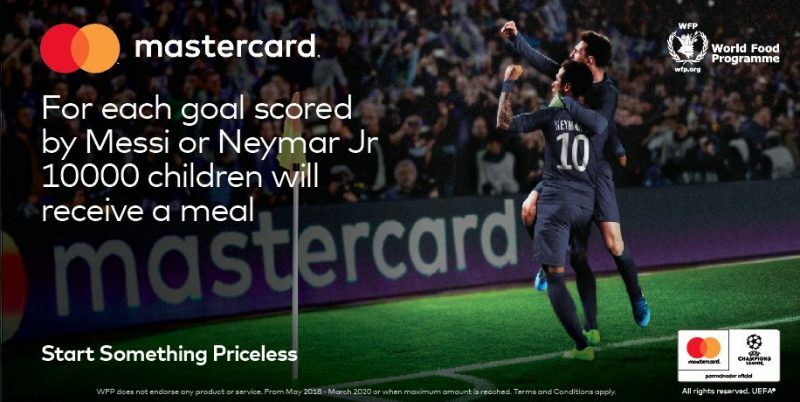 For every goal Messi and Neymar score in the tournament, Mastercard has pledged to donate 10,000 meals to improverished children in the Caribbean and Latin America. Thanks to this initiative we now have the gamification of starvation and poverty. It’s crass, cynical and thoughtless. It conjures up images of famished families holding empty bowls, cursing their fate as Neymar shanks a sitter from five yards before renewed hope: ‘Penalty! Gather round kids, lets us pray Neymar takes it so you can eat!’. What happens if either player gets injured? Should we now heap abuse on an unsporting keeper for making a string of saves that prevented 50,000 meals being dished out? Looking at the conversation on social media, some have said at least its better than not giving anything at all but that entirely misses the point. If Mastercard wanted to demonstrate they really cared and wanted to make a difference, they would, as The Times’ football writer Henry Winter pointed out, give them the meals anyway, not turn it into a game of chance. Meanwhile, Ian Wright tweeted that it was ‘The worst marketing idea ever’. Who the hell thought this was a good idea? Perfect Curve? What was the comms person in the room doing when this was being discussed? “I’m happy I can help make sure that children in the region can have a plate of food and more hope. Latin Americans know we can do great things when we come together, and this is an example of that. Together we can fight hunger,” Neymar Jr. said. Nope, thats right, Mastercard really have amplified its sponsorship of the World Cup with a Hunger Games initiative. The only question is which one of Messi and Neymar is Peeta and who is Catniss? As CSR own-goals go this is, to use the corporate lingo, priceless.